You missed it! You can read below to see what you missed. Be sure to subscribe to Cyber Pro Review so you won’t miss the next awesome product launch deals. With its state-of-the-art drag and drop technology, its massive libraries of 100 done-for-you templates, and oodles of graphic elements, Instabuilder may be the best website builder available today. InstaBuiler makes it easy to build responsive, mobile-ready Internet marketing websites almost instantly. InstaBuilder is a website builder ideally suited for Internet Marketing professionals, but is certainly not limited to that niche. 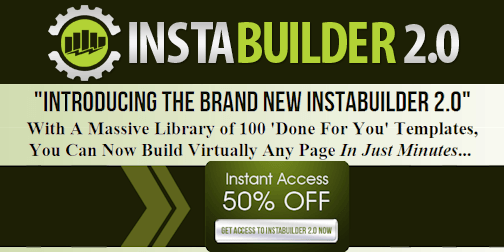 InstaBuilder is a website builder designed by and for Internet marketing pros. This is an Internet Marketer’s dream, with all of the design elements common to this industry, including landing pages, welcome pages, countdown scarcity timers, squeeze pages, and so much more. These are things that have proven effective in the design of websites that attract and convert customers. InstaBuilder works within the world’s most popular and easy to use website content management system, WordPress. This is an “all-in-one” WordPress plugin that makes it extremely easy to create high converting web pages without being a technical guru. InstaBuilder’s easy to use drag and drop visual editor, with over 100 pre-built templates takes away all the hassel of designing a sales oriented website. Instabuilder even features a built-in image editor, and includes a generous supply of ready-made marketing graphics. WordPress is an increasingly popular website platform. One of the drawbacks to WordPress, however, is that pages are largely database driven, and created on the fly as website visitors surf through your website. InstaBuilder 2.0, however, has a built-in HTML converter that will transform your static pages into HTML for faster browser loading. Also important to note is that all pages built the InstaBuilder website builder software are responsive and mobile ready. In a world where mobile device users are becoming more common than desktop computer users, websites that have not been designed with this in mind are simply missing the boat. While InstaBuilder version 2.0 is currently in launch, this is not a new entry into the website builder software niche. This is a mature product that has been reintroduced with a slew of new and enhanced features. Click on the image below to view a short video presentation that highlights some of the important features of this WordPress website builder. There are 3 versions of the InstaBuilder license, and 3 associated price tags. The first of these allow you to use the product on up to 3 personally owned domains. Early bird customers during the launch were offered this at just $37, a bargain by any standard, but the price goes up gradually during the course of the launch, thus rewarding those who take action quickly and help drive the frenzy. At last check this price was $43.05. The second license version removes the 3 domain restriction, and was introduced to early birds for just $57. The $20 premium makes sense for people who have or plan to have more than 3 domains on which InstaBuilder will be used. This price also goes up during the launch, and stood at $64.65 at last check. The third license is for developers who will use the product to develop websites for clients. Introduced at just $67, at last check this price had risen to $81.70. As is common in such product launches, particularly where demand is strong, the early bird gets the best bargain. As is also true in life, he who hesitates is punished for not being decisive. Many “Front End” products sold in the Internet Marketing niche are followed by “One Time Offers” (OTOs), upsells and downsells. Once buyers have become paying customers, they are often rewarded with special deals on product enhancements, or the opportunity to buy related products, services, or training programs. These OTOs are typically not offered to the general public, or non-customers. The makers of InstaBuilder have some very interesting OTOs available exclusively to customers who buy Instabuilder 2.0. The first of these is the PRO version of InstaBuilder. The PRO version is only available to purchasers of the front-end InstaBuilder 2.0 product. This is to be offered on a monthly subscription at $37 per month, which will provide new templates on a monthly basis. During product launch, however, the PRO version is available for a one-time investment of $97, instead of the $37 monthly subscription. The PRO version consists of 5 components. First is the Instant Funnel Creator. This is an add-on plugin that automatically creates a series of sales funnel pages. Obviously, this is particularly suited to Internet Marketing professionals who conduct multiple product launches each year, where multiple products are involved. The second component of the PRO version is 1-click template selection, featuring multiple template designs. These template sets allow variety while giving a consistent design to all of the pages in the entire funnel. The content of each page of the funnel can be easily edited and customized as needed. The 3rd PRO version component is the 1-click HTML Page Converter. Once your pages have been created within WordPress, with 1 click your entire funnel is converted to HTML format, which typically loads into web browsers much faster than WordPress sites. Component number 4 of the PRO version simplifies split testing. Easily conduct your split tests and monitor the statistics of your sales funnel. Next, and perhaps most importantly, is the 5th component to the PRO version. This is where the monthly subscription function kicks in, giving you new templates each month. For full-time Internet marketing professionals, the Pro version is an outstanding bargain. If you sell multiple products online, you really need to go PRO. The added one-time $97 investment for the PRO version (only available if you get in quickly during the product launch) is clearly a bargain you won’t want to pass up. If you are on the fence, consider this: You have 60 days to try it. If for any reason you are unhappy with your investment during those 60 days, you can get your money back. OTO #2 is also very interesting. This is a collection of ten additional templates priced at $297 for the bunch, and no-doubt worth every penny. BUT, you can save $220.00 if you act fast. During product launch week, ending Sunday Dececmber 14, 2014, you can get this OTO for just $77.00. If you are into TesSpring (and a lot of people are making money in this niche in case you are not), then you can turn your next TeeSpring campaign into a viral social contest and systematically BOOST your campaign to astronomical heights! WP Tee Contest lets you create engaging contests with the objective of getting email signups… building your list on a viral level. WP Profit Page turns your content pages into high converting, SEO-optimized money-making pages with a very little effort on your part! The best part is: you don’t necessarily need A LOT of content to make this happen. Turn video pages into profit-pulling, SEO-optimized pages! If your wordpress site or blog is mainly video-content or media-driven, this plugin helps optimize your pages, brand it as an authority site, increase page views, and pull in maximum affiliate commissions! Create, edit and post memes to your wordpress site or blog! Leverage on the Internet’s most popular image sharing phenomenon — easily create viral-worthy memes to share on your blog and even upload to social media sites like Facebook, Twitter, Pinterest, etc. WP Share It Now is an easy-to-use, newbie-friendly plugin that allows you to send viral traffic to your blogs, increase your sales, and even builds you a responsive opt-in lists! And you can achieve this by enabling the share features with coupons and discounts as popular incentives. Monitor your websites keyword rankings on Google. This plugin lets you keep track of your keyword ranking progress in a highly structured data presentation. It also has a built-in keyword research tool you can use to generate lists of keywords to use on your site. Create well-designed, customizable and RESPONSIVE contest pages to help you build your email lists! The plugin lets you run contest where you can customize your prizes and incentives for participants. You can leverage on contests to grow your email list. Quite simply: People sharing = new people entering the contest = new email subscribers! And that all leads to more sales and more profits. Duh! Easily and quickly set up multiple ads in minutes! You can showcase your top offers anywhere on your wordpress site including blog posts, side bar widgets, header, footer, and even in pop up window! There’s more to this plugin that just creating powerful graphic ads… you can also also track your stats such as clicks, impressions and conversions — allowing you to split test your ads! Forget expensive, dedicated support helpdesk software. You can now have your own support helpdesk built into your wordpress site! WP EZ Ticketing bridges vendors and customers through its innovative support ticketing system. WP EZ Quiz lets you easily create fun, entertaining Facebook quizzes  with just a few clicks of your mouse! Keep your campaigns, surveys and quizzes interactive with visitors – You can use this to grow your traffic using a series of trivia quizzes. Ideal for niche websites. These are each handy tools in their own right. But these are offered to you with Private Label Rights. Buy this collection and they are yours, including source code, to re-brand and sell at will without having to pay royalties to the developer. Your investment of $77 gives you ten products you can modify as your own, or simply sell them as is, and keep all the profit. This is like a gift from Heaven, a reward for purchasing an already outstanding bargain in InstaBuilder 2.0. If $77 is too much, you can get the first 5 of these plugins for just $47 as a downsell. The bottom line is that InstaBuilder 2.0 is a must buy for any Internet Marketing professional. For any serious Internet Marketer who develops or sells products online, the entire bundle of products, including the two upsells, is a no-brainer. If you miss this opportunity, you are sure to regret it.